Bookride: Collecting early bibles in English 1. Collecting early bibles in English 1. 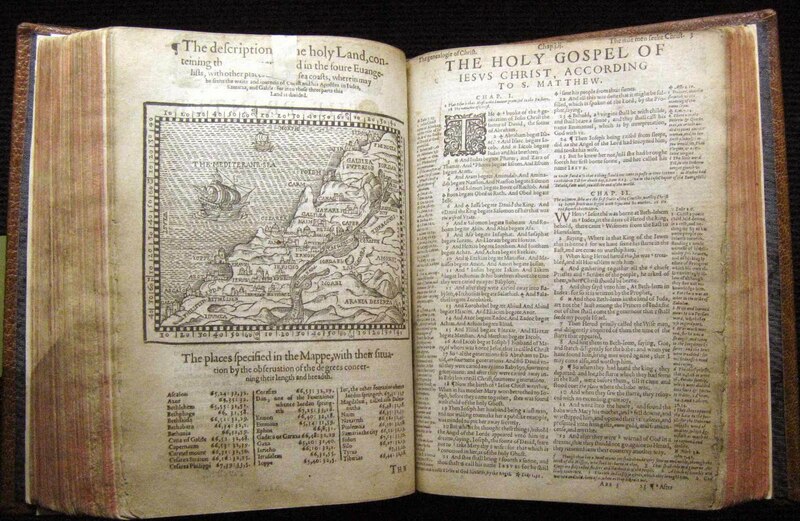 Four centuries after the King James version of the Bible appeared, we are taking a look at collecting early bibles. First, forgive me for stating the obvious, but you can forget your average family bible from the Victorian period—bound in black gilt- tooled leather, with brass clasps and weighing in at half a ton. Frankly, for all their ancestral inscriptions, often in barely decipherable hands and complete with blots and mathematical calculations ( what’s that all about ? ), they’re invariably boring and uninspiring, with or without illustrations. And although it’s undoubtedly true that some of the eighteenth century bibles were beautifully printed by masters like Baskerville, they are essentially pedestrian, though plain and elegant as a Georgian box pew. It seems to me that unless you’re turned on by association copies, anyone going in for bibles must be interested in the printed contents, rather than the look or the age of the volume. After all, a King James Bible printed in, say, 1638, isn’t that interesting as a text, for all its age and quirky spelling. Apart from misprints, this text remained essentially unchanged since 1611, when the first King James version was published. As a teenager I was thrilled to acquire from Dylan Thomas expert Jeff Towns for £1, a lovely large quarto copy dated 1629 in its original binding, A year before, I had secured in Hay on Wye a tiny pocket bible from the 1640s, only to regret the purchase ( it was about £2 ) because the miniscule type was murder on the eyes. Not long afterwards I sold it for £10 to an American evangelist ( he may have been a Mormon ) who knocked on our door. 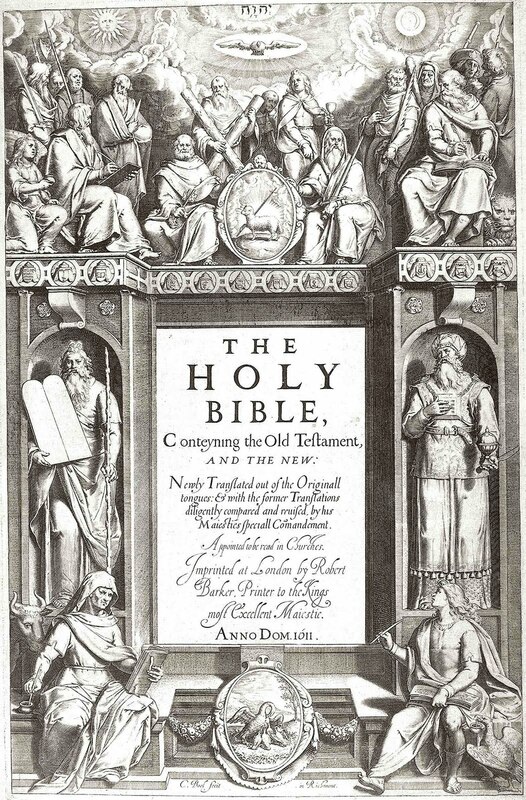 I later discovered that throughout most of the 17th century the bible was reprinted every year. Which means there must be hundreds of thousands of 17th century bibles around. And although the ‘ wicked ‘ bible ( 1632 King James version which omit the word ‘ not ‘ in ‘Thou shall not commit adultery ‘) is an amusing rarity, I can’t see that it is worth paying so much extra for a copy of this curiosity. 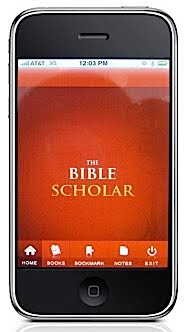 American bible dealers have the right scholarly attitude and much information may be gained from their websites, if you can tolerate the quasi-evangelistic tone and the hard sell. Although most seem to live in the deep south and probably have dubious attitudes towards homosexuality and the environment, they know their bible history and what’s worth buying. Some of them even have Ph Ds in theology. Do you need to be well healed to buy early bibles ? Well, yes and no. Just over a year ago I was lucky to secure for a measly £20 a fine copy, dated 1611, of a Geneva Bible—the text familiar to Shakespeare—and the one on which the King James version was heavily dependent. I later found out that publication of this earlier text continued long after the King James had appeared—such was the continued demand for it. But again, it must be stressed that later issues of the Geneva Bible are nearly as thick on the ground as most seventeenth century issues of the King James---and for the same reason. Each family above a certain level would have owned a bible and bibles were not thrown away. 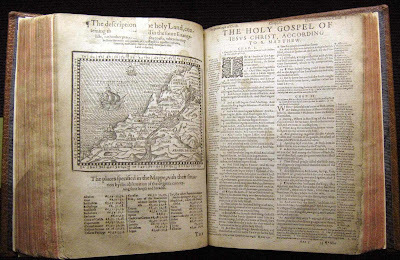 But again, copies of the first edition of the King James are very rare for the obvious reason that like the first edition of any book, the publishers are never sure how many copies to print, especially as the Geneva bible was still the one that every family owned. Hence the 1611 edition of the King James is very, very expensive. Be prepared to shell out over £100,000 for a copy. 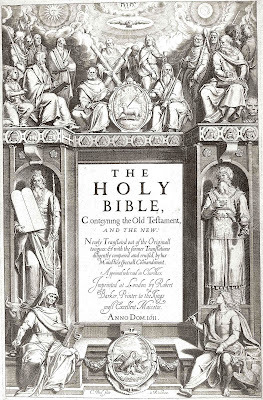 Later editions, as I say, can be bought for much less, though quite a few knowledgeable dealers, playing on the public’s ignorance, seem to think it’s quite OK to charge big bucks for a perfectly ordinary seventeenth century King James version.